The Tektronix 496 provides high performance spectrum analysis and measurements in the 1 kHz to 1.8 GHz range.Its high stability and 80 dB dynamic range meet your demands for proof-of-performance measurements, on site or on the bench. Resolution bandwidth can be varied from 1 MHz to 30 Hz over the entire frequency range. Automatic phase lock stabilization reduces incidental FM to 10 Hz p-p; phase noise sidebands are at least -75dBc at 30 times the resolution bandwidth offset. Frequency drift with phase lock is typically 1 kHz in ten minutes after 30-minute warm-up. 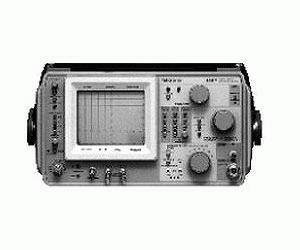 The 496 provides 1 kHz frequency resolution in Delta-F mode. Fully calibrated amplitude in dBm or dBmV The 496 provides high performance spectrum analysis and measurements in the 1 kHz to 1.8 GHz range.Its high stability and 80 dB dynamic range meet your demands for proof-of-performance measurements, on site or on the bench.